Members of the Regional Community Policing Institute Governing Board recently met in the Criminal Justice Center at Sam Houston State University. Those attending the meeting included board members, staff from the Texas Regional Community Policing Institute, and staff from the Office of Community Oriented Policing Services in Washington, D.C. The Texas Regional Community Policing Institute at Sam Houston State University has been awarded two grants totaling $750,000 from the United States Department of Justice. The institute at the university is one of 27 regional community policing institutes funded by the Justice Department's Office of Community Oriented Policing Services (COPS) for the upcoming year. One of the grants, for $500,000, is for continuing operations. "The funds are earmarked for ensuring integrity in policing, and they will allow the institute to continue its general operations in providing training and technical assistance on a variety of community policing and other timely topics to law enforcement agencies in Texas and the communities they serve," said Phillip Lyons, director of the institute. The office also announced a separate award of $250,000 to the institute to establish a multi-state program to provide training to law enforcement agencies in recognition, identification, collection, storage and provision of testimony about DNA evidence. "This award will capitalize on the strengths of several SHSU College of Criminal Justice faculty including Dr. Steven Cuvelier, an expert in web-based instruction; Dr. Richard Li, a forensic scientist; and Dr. Sparks Veasey, a forensic pathologist who is also an attorney," said Lyons. "The training efforts supported by this award will further justice through the promotion of greater reliance on more reliable forms of evidence," said Lyons, "thus reducing the likelihood of erroneous criminal convictions and civil judgments." Grants were awarded to three other regional community policing institutes across the country including New York, Tennessee and Illinois. In addition to training law enforcement officers in Texas, the institute at Sam Houston State will provide DNA training to law enforcement officers in the western United States, including New Mexico, Arizona, Oklahoma, California, Nevada, Utah, Colorado, Washington, Idaho, Montana, Wyoming, Oregon, Hawaii and Alaska. "We, by far, have been tasked with training the most states and the greatest population of law enforcement officers," said Robert Werling, project coordinator with the Texas institute. "However, the COPS office has also expressed confidence that we can provide competent, professional training to law enforcement officers in these states." In both programs, the institute will focus, as they have in the past, on ways of engaging communities that historically have been excluded from community policing efforts and will target small and medium sized communities that lack their own training infrastructure. "We have always directed our efforts at those agencies and communities that need us most," he said. "Larger agencies typically have the resources they need to keep abreast of developments in the field. Smaller agencies usually lack those resources, but their constituents, of course, are no less deserving," he explained. "The COPS office, through its support of the regional community policing institute network, allows us to help ensure that everyone has access to leading edge training." 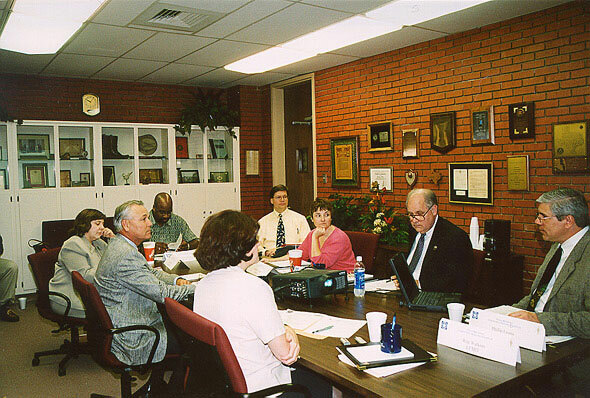 The Texas Regional Community Policing Institute was established in 1997 under the supervision of its founding director, Randy Garner, associate dean and professor of criminal justice at Sam Houston State University, who continues to serve as a grant administrator, along with Lyons. Since its inception the institute has provided more than 200 training sessions totaling in excess of 76,000 contact hours to approximately 10,000 participants.